CLEVELAND – Johnny Manziel lied to the Browns after a video surfaced of him partying at a club, FOXSports NFL Insider Jay Glazer reports. The warning signs were there from the beginning. A lot of NFL experts believed that while Johnny Manziel had enough talent to succeed as a pro, there were plenty of red flags to insist he lacked the maturity. He was too young, too impulsive and too in love with the college party life to take on the responsibility of leading men to battle on Sundays. Never has that been more clear than with the most recent incident. A video surfaced of the second-year quarterback partying during the Cleveland Browns bye week. This apparently after the team expressed the desire that he hang around the team facility and lay low for once. The fact alone that he ignored them was a bad sign, but more information has come to light that really puts his benching and his likely dismissal from the team down the road into perspective. “As if Browns quarterback Johnny Manziel hadn’t already given the team more than enough reasons to never trust him again, here’s another. According to Jay Glazer of FOX Sports, Manziel lied to the Browns about the circumstances surrounding the photos that surfaced following his bye-week excursion to Texas. That doesn’t just signal the fact that Manziel has his priorities in the wrong place, it shows he lacks a degree of honesty that great quarterbacks need to get teammates and coaches to trust him. For all the good things he did in college, it’s apparent he probably left before he learned the final ingredient to being a winner: responsibility. Hard as it is to admit, NFL teams don’t like players that show intent to deceiver for their own selfish gains. Johnny Manziel already had enough doubts before he even took a snap in Cleveland. With the growing list of problems he’s caused since making the jump last year, he’ll have a stigma around him that is almost impossible to erase. Thing is, it’s his own fault. The topsy-turvy NFL career of Cleveland Browns quarterback Johnny Manziel took another turn on Friday when the ABC news affiliate in Cleveland reported he was involved in a domestic argument earlier this week, and alcohol was involved. Manziel, the second-year Browns quarterback, was involved in an argument with his girlfriend from Texas Christian University, Coleen Crowley, newsnet5.com reported. The incident started at 6 p.m. on Monday, according to the report. According to the police report, Crowley accused him of pushing her head into a car window. According to the police report both Manziel, who spent about 10 weeks in rehab this offseason, and Crowley were drinking but not charged. According to Mary Kay Cabot of the Cleveland Plain Dealer, Manziel told police he had two drinks, and his girlfriend was impaired. In the report, Crowley told police Manziel pushed her head into a window. She wanted her cell phone because she was concerned about her safety and said she just wanted to return to Texas. The report stated police did see an abrasion on Crowley’s arm but later determined that the abrasion was from Manziel’s attempt to keep her from getting out of the vehicle while it was on the road. and when we talked to the police and they realized everything was alright and I was sober, we went home together and everything is fine. Police determined the couple wasn’t intoxicated enough to be charged, Crowley didn’t want to press charges, so they were allowed to leave the scene in Manziel’s car. The report is troubling in a few ways. Manziel spent time in rehab this offseason for an unspecified reason, and he has asked that the circumstances surrounding that stay in rehab remain private. Manziel’s partying before this year has been often discussed on social media. He was released from rehab in April. Tony Grossi of ESPN Cleveland said that a team spokesman said Manziel will be active for Sunday’s game. “I owe private apologies to a lot of people that I disappointed but a very public one to the Browns organization and the fans that I let down. I take full responsibility for my actions and it’s my intention to work very hard to regain everyone’s trust and respect. Manziel got a chance to start in Week 2 because of an injury to starter Josh McCown, and led the Browns to a win. Many thought Manziel should have been given a chance to start for Cleveland going forward, but the Browns stuck with McCown. 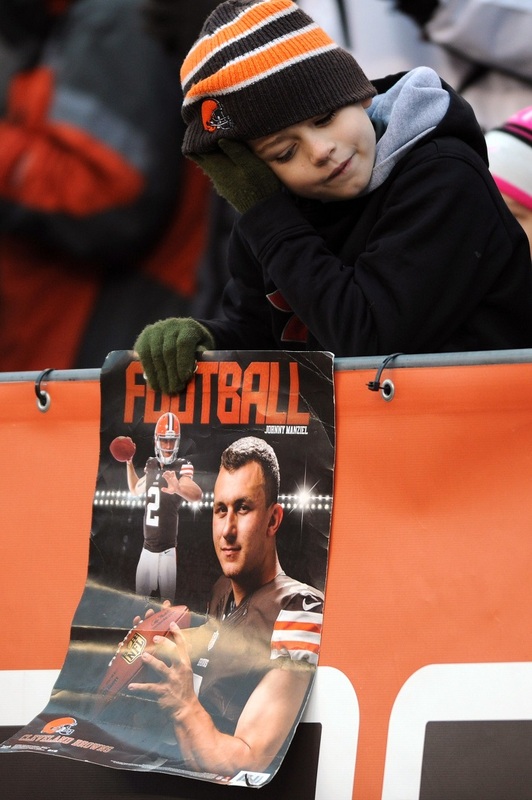 But Manziel’s NFL future looked much brighter than it had for months. After this latest incident, it appears again that Manziel might have to start building up trust again in the Browns organization. Cleveland Browns quarterback Johnny Manziel entered a rehab program last week, seeking help after a season in which he made more headlines for partying than for his play on the field. He entered the facility, the name of which was not revealed, last Wednesday. Nor was the problem for which he is seeking treatment specified. “We respect Johnny’s initiative in this decision and will fully support him throughout this process. Our players’ health and well-being will always be of the utmost importance to the Cleveland Browns. We continually strive to create a supportive environment and provide the appropriate resources, with our foremost focus being on the individual and not just the football player. Johnny Football, the 22nd pick in the first round of the NFL draft, struggled mightily to grow into the NFL game, despite a glittering resume that included a Heisman Trophy. He often spoke of wanting to be the Browns’ starter and of taking his job and himself seriously, then turned up on social media partying with friends and celebrities. The cycle was repeated often throughout the season, with the result that by the end the Browns were ready to look elsewhere for a quarterback.